I could not think of a living jazz musician more deserving of a documentary about him or herself than the great Clark Terry. It was a true high point in my career when I had the opportunity to interview Clark Terry a couple of years back, hearing about what it was like to instruct Miles Davis, play with both Duke Ellington and Count Basie, and to hear him perform “Mumbles” a few feet in from of my face. Now, his influence and inspiration will be brought to the screen in a documentary called “Keep on Keepin’ On”. The film primarily focuses on Terry’s influence on two musicians: the co-producer of the film (and drummer) Alan Hicks, and blind pianist Justin Kauflin, both in their twenties. Terry, who is 90, maintains the same intensity and straight talk with these two students as he might have with former students like Quincy Jones and Miles Davis. The phrase “Keep on Keepin’ On” is a phrase that Terry has used for over 70 years in an effort to motivate and inspire students. The filmmakers have been attempting to fund the film out of pocket, but have also incorporated donations through Kickstarter, a unique participatory funding resource that allows individuals to contribute to the project. Depending on how much individuals might give, donors can receive a variety of Clark Terry memorabilia. Donations are being accepted through August 8th. The film also follows Terry as he works on his autobiography, due for release in October. Congratulations to Clark Terry, not only one of the few remaining living legends of jazz, but someone who has spent so much time educating and mentoring others in the art. Happy birthday to one of the greatest jazz trumpeters ever, and a musician who inspired me personally as a trumpet player. CLICK HERE to listen to my interview with Clark Terry from 2007, which includes him playing his famous “Mumbles”. Also, CLICK HERE to leave a happy birthday message on his blog. Is there a jazz musician alive today that deserves the Lifetime Achievement award more than Clark Terry? I’m happy to see that he was recognized for that award this year at the Grammy Awards, along with Bobby Darin, Michael Jackson, David “Honeyboy” Edwards, Loretta Lynn and Andre Previn. Clark was quoted as saying at the ceremony “I’m going to keep doing it until I get it right”. 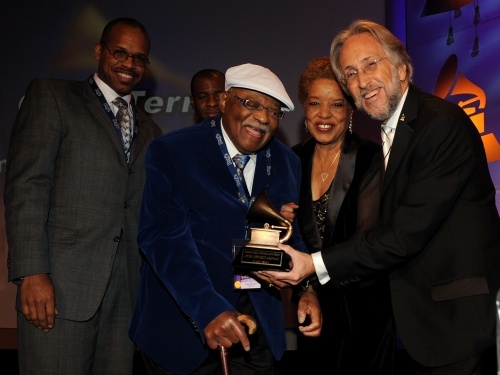 Congrats to one of my trumpet heroes, and the man that still possesses the happiest sound in jazz. When your name is Duke Ellington, it doesn’t really matter what anniversary of your birth it might be, or how long you’ve been dead, there always seems to be a stream of celebrations and remembrances every April 29th. On this, the 110th anniversary of Duke Ellington, one of the greatest musicians and composers in history, I chose to remember Duke in a different way. Ellington died five years before I was born, so for me to “remember” him might be a little out of place. Instead, I invite you to click the link below and listen to a portion of my 2007 interview with legendary trumpeter Clark Terry. Terry spent years touring and recording with Duke, and in the audio Terry remembers Duke, talks about his attitude towards compositions that just didn’t quite work, and compares Ellington to Count Basie. To hear this audio blog, click here. Enjoy! I’m guessing that I’m not the only one who wasn’t aware that Duke Ellington’s The 1952 Seattle Concert was his first legitimate live performance release (with the exception of a few V-Discs). To be honest, I didn’t even know there was a Ellington Seattle concert recording until I came across it, and and today marks the 57th Anniversary of this concert. One of the interesting things about this recording (aside from the fact that this is an anniversary of it and that it took place in my backyard), is that it showcases some new members at a time after Duke’s top star, Johnny Hodges, and two others, had departed. Drummer Louis Bellson was perhaps the most notable addition, along with valve trombonist Juan Tizol, slide trombonist Britt Woodman, saxophonist Willie Smith, and trumpeter Willie Cook. The new members contributed not only with their instruments to this concert, but with their compositions as well. The band performed Skin Deep (the opening number) and The Hawk Talks by new drummer Bellson, as well as contributions by Tizol including Caravan and Perdido. Perdido became a showcase tune for trumpet section leader Clark Terry. I interviewed Terry a couple of years ago, and while he might not be able to play like he did 57 years ago (triple-tounging notes as only he could), he maintains the same personality in his playing that he did when playing with Duke. Clark Terry shines on this recording, and did with the band until he left in 1959. Other highlights of the release include multiple Ellington standards including It Don’t Mean a Thing, If It Ain’t Got That Swing, In a Sentimental Mood, Mood Indigo, as well as a 15 minute version of Ellington’s Harlem Suite. This is a nice item to add to a jazz collection, again as it highlights the beginning of a series of great live recordings released by Ellington. While Duke’s Newport live recording from 1956 still might be his live performance highlight, this album is highly recommended.